YO! Sushi opened its first restaurant in Soho in January 1997. YO! 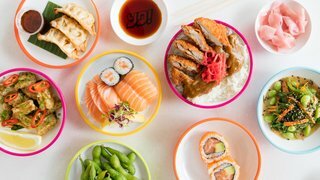 Sushi specialises in serving sushi to customers using the Japanese style 'kaiten' - a conveyor belt method. In each restaurant, sushi dishes and Japanese cooked foods are prepared in an open view kitchen and then set on a conveyor belt, so you can grab, eat, and pay.